Deep breathing all the way down the spine and into the pelvic region expanding the breath into the back and sides of the ribcage. Abdominals properly pulled in by drawing the belly button towards the spine so that they provide a supportive corset for the whole trunk. Knowing how to breathe while keeping the abs contracted gives us extra support throughout movements and exercise. 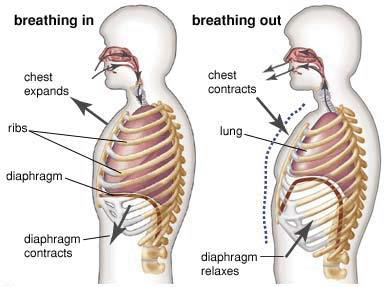 Being able to perform lateral/ribcage breathing as well as diaphragmatic/belly breathing will increase your overall breathing capacity and body awareness. Use while lying down, standing, or sitting so that your expanded ribcage can help support the weight of the upper body and minimize pressure on parts below. Practice ribcage breathing first lying on your back with your knees bent, then progress to a seated position with feet and legs spaced comfortably apart. Place your hands at both sides of the ribcage with fingers in front and thumbs at the back. 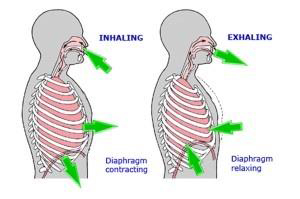 Slowly inhale (breathing in) and let your ribcage expand out to the sides and towards the back and then slowly exhale (breathing out) letting your ribcage relax and move down and in. DO NOT hold your breath! 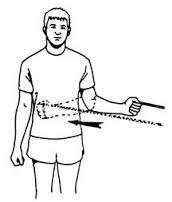 Draw the abdominal muscles in to the waist pulling your button towards your spine. Hyperventilation is possible if this breathing exercise is done too many times continuously, so normal breathing should be resumed after 3 or 4 deep breaths before repeating. Perform deep breathing as you relax all muscles throughout your body for 2–5 minutes. IF YOU STILL HAVE TIGHTNESS AT THE BASE OF YOUR HEAD -PROCEED WITH THE FOLLOWING. 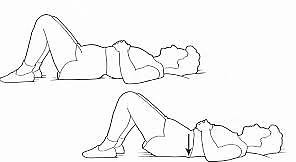 Lie on back with pillow under mid-back, small to no pillow under head & neck; or sit on couch or lie on bed and let head hang off the edge. Turn head in opposite direction away from the tight/tender area. Take your time. Small adjustments can make a big difference. Breathe & relax all muscles of the body. Remember to move slowly after each position. 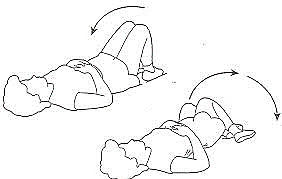 Perform exercises 2x daily preferably in morning and evening while in bed. Sitting: Palpate point midline on the sternum/chest plate. Slowly slump in the chair, gently folding your body over the point until the tenderness diminishes. Find the position of greatest comfort and relax while supported in this position for at least 2-minutes. Slowly move out of position. 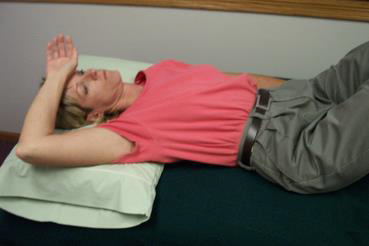 Lying On your back: locate tightness or tenderness on the front hip or belly area. 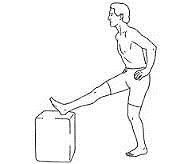 Place feet and lower legs on top of a laundry basket, sofa, or chair. Move knees to the right – and feel for decreased tension & tenderness in the hip/belly area. Rest in this position for 2 to 10-minutes, breathing and relaxing all the muscles throughout your body. Perform 2x daily – preferably morning & evening when you are not in a hurry and able to relax. Place right arm up alongside of your ear or head. You can put right hand under forehead if it feels better. Place left arm up alongside of your ear or head and reach to stretch arm away from shoulder blade (you can put left hand under forehead if it feels better). Posture Lift- hands on top of head, raise crown of head into hands with resistance, hold for 5 counts, and relax for 5 counts. Repeat 3 times. 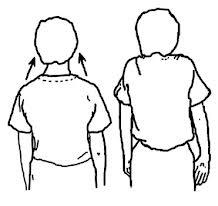 Neck Stretches- chest up, shoulders back and tighten abdominal muscles Side Bend-bring ear to shoulder while looking straight ahead, hold for 10-20 sec. Repeat 3 times each side. Rotation-turn head to right, hold for 20-30 sec. Repeat 3 times each side. Knee Extensions- with fists squeezed between knees straighten knee, hold for 10 sec and slowly lower. Repeat 10-30 times each leg. Deep Breathing- same as before, only this time bring belly button towards spine and pelvic floor upsqueezing your bowel and bladder control muscles. Hold pelvic floor up on inhalation and relax on exhalation. Do until tired. Pelvic Bowl/Circles- starting at tail bone, allow each vertebrae to drop down along the floor. Pelvic rock forward and backwards again, breathing in as you raise up and exhale as you flatten out. Use pelvic floor muscles. Then switch to side to side then in a circle- 30 times for each movement. Tummy Tightening (on hands and knees)- inhale to prepare when relaxed, then exhale as you pull belly button towards spine trying to maintain a neutral pelvis, hold for 10 counts. Repeat 10-30 times. Tummy Tightening (on back) – exhale as you bring belly button towards spine trying to maintain a neutral pelvis. Hamstring Stretch- legs on ball, straighten one knee & pull toes towards nose, hold 20 sec for 3-5 times. Knee Sway- with/without ball-knees together and sway from side to side. Repeat 10-30 times each. Angel Arms- legs on ball, move arms up to above head then down to sides (like making a snow angel). Repeat 3-10 times. Bridging- legs on ball with knees bent then lift buttocks off floor while tightening stomach and buttocks, hold for 10 sec. Repeat 10-30 times. Progressive Knee Lifts- heels on ball with a neutral spine, pull belly button to spine keeping back flat. Then alternate lifting one foot away from the ball- like marching. Repeat 10-30 times or STOP when your back starts to arch. Side Stretch- kneel with ball alongside of body. Side stretch over ball raising top arm overhead and bottom arm to floor. Straighten top leg first then bottom leg splitting your legs for balance. Hold for 20-30 sec. Repeat 3-5 times each side. Prayer Stretch- hands on ball and heels to buttock, straight stretch, side to side stretch, deep breathing. Hold for 30 sec. Repeat 1-3 times. Nerve Stretch (Carpal Tunnel) – stretch arm straight out to side placing ball between wall and hand. Extend wrist back so palm of hand touches ball. Fingertips opposite of nose. Keep shoulders down and turn head away from wall. Hold for 15-30 seconds. Repeat 3-5 times per side. Shoulder Roll- lay with stomach on ball while maintaining a neutral spine. Bend elbows as if rowing, squeezing shoulder blades together. Repeat 10-30 times. Opposite Arm/Leg Lift- raise one arm and opposite leg hold for 5-10 sec. Repeat with other arm/leg 10-30 times each. Standing tall with your belly button drawn in towards your spine, bend your elbow and keep it tucked close to the side of your body and move to the inside of the doorframe. Place the back of your hand against the doorframe keeping the elbow bent and give appropriate resistance (25%, 50%, 75%, or 100%) into the doorframe without any movement from your starting bent elbow position. Hold for 5-10 seconds and repeat 3-5 times for the appropriate shoulder. Standing tall with your belly button drawn in towards your spine, bend your elbow and keep it tucked close to the side of your body and move to the inside of the door frame. Place your palm against the doorframe keeping the elbow bent and give appropriate resistance (25%, 50%, 75%, or 100%) into the doorframe without any movement from your starting bent elbow position. Standing tall with your belly button drawn in towards your spine, bend your elbow and keep it tucked close to the side of your body and move towards the wall. Place your fist against the wall keeping the elbow bent and give appropriate resistance (25%, 50%, 75%, or 100%) straight into the wall without any movement from your starting bent elbow position. Standing tall with your belly button drawn in towards your spine, bend your elbow and keep it tucked close to the side of your body and back up towards the wall. Place your elbow against the wall keeping the elbow bent and give appropriate resistance (25%, 50%, 75%, or 100%) straight into the wall without any movement from your starting bent elbow position. Standing tall with your belly button drawn in towards your spine, bend your elbow and keep it tucked close to the side of your body, turn sideways and move towards the wall. Place your shoulder and elbow against the wall keeping the elbow bent and give appropriate resistance (25%, 50%, 75%, or 100%) straight into the wall without any movement from your starting bent elbow position. This is a mindful exercise and you must concentrate on technique which is more important than repetitions. It is like retraining your mind and body to write your name differently than you have for all these years. You have to think every time you start the activity to facilitate effective change. 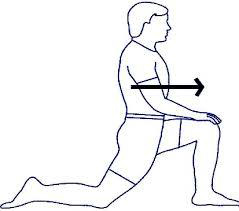 Very important and effective: practice this way of bending and moving several times throughout the day every time that you sit down and get up from a chair, get in and out of your car, when you are standing/bending in the kitchen, watching sports, waiting in line at the grocery store, or golfing. Repetition is what creates change! If you experience pain STOP and try re-adjusting or change the towel. CAUTION: DO NOT TAKE A NAP OR SLEEP AT NIGHT LIKE THIS! IT WILL MAKE YOU VERY SORE! Repeat with the left leg back. Alternate between right and left until 2-3 sets have been performed on each leg. Position yourself as above but bend the back knee slightly until a gentle pull is felt in the lower calf towards the Achilles tendon/ankle and hold for 30 seconds. Lie on your back with your head and neck supported. Keeping your belly button drawn in towards your spine with your back and your left leg flat to the floor, bend your right knee and with both hands placed comfortably behind the knee pull it towards your chest. Repeat with the left leg. Alternate between right and left until 2-3 sets have been performed on each leg. Sit on the edge of your chair with your leg off the chair but still sitting safely. You can gently hold the side of your chair for support if needed. Keeping your belly button drawn towards your spine, hold onto a chair, railing, or wall for support. Keep your stomach in, chin tucked, and head & neck aligned and straight. Hold the stretch for 5-30 seconds, breathing evenly as you hold. You can do this on and off throughout the day as tolerated. Avoid hyper extension of knees! Most important have fun!! Stretching exercises can be fun and will reduce injuries and pain associated with playing any sport. Healthy habits and injury prevention begins at a young age. Check out our list of exercises that you can perform to assist with your various needs.